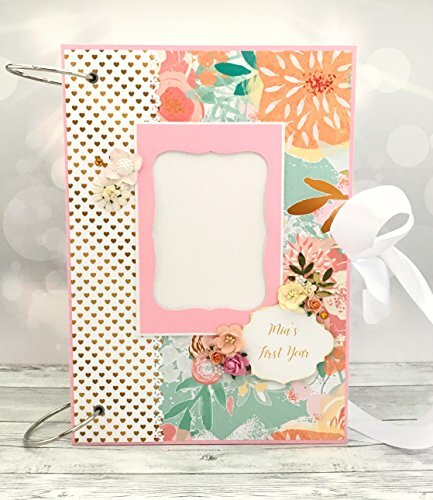 This cute peach and mint Kristabella Creations scrapbook album comes in size A4 (8.3 x 11.7 inches). Inside there are 20 pages (10 sheets) of luxury card stock embellished with high quality designer papers. There are also lots of pockets, flaps and individual segments. The new baby journal has 2 usable hard cardboard covers with pockets on the inside. It holds more than 90 photos! Also included are memory tags, paper ephemera, die cuts, flowers, lace, pearls, etc. and a special BONUS: 12 baby month cards and a milestones card! This baby memory book is a CUSTOM order and not an in stock item. I'll be very happy to create another one just for you. It will be an unique product with a similar design, colors and decorations of your choice. There will be some variation due to being handmade.